I know some folks out there might have had trouble following the Vice Presidential debate. 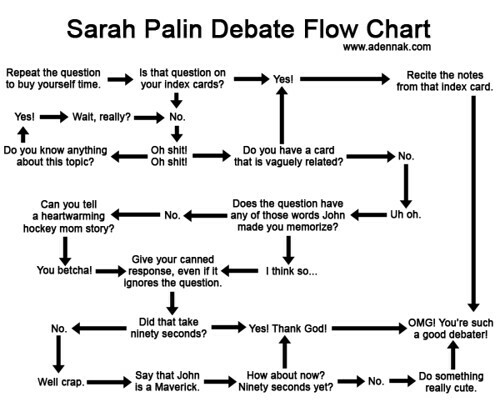 Particularly, trying to parse meaning from the things that Sarah Palin said. With that in mind, I have compiled a handy resource for your perusal. I hope to update this chart, both graphically and grammatically, when it is no longer ten to five in the morning. For for the mean time. . . enjoy! You work three jobs? … Uniquely American, isn’t it? I mean, that is fantastic that you’re doing that. I’m going to spend a lot of time on Social Security. I enjoy it. I enjoy taking on the issue. I guess, it’s the Mother in me. I strongly believe what we’re doing is the right thing. If I didn’t believe it — I’m going to repeat what I said before — I’d pull the troops out, nor if I believed we could win, I would pull the troops out. I believe that a prosperous, democratic Pakistan will be a steadfast partner for America, a peaceful neighbor for India, and a force for freedom and moderation in the Arab world. People don’t need to worry about security. This deal wouldn’t go forward if we were concerned about the security for the United States of America. 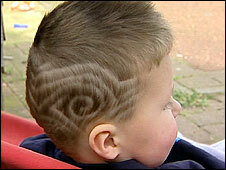 A three-year-old boy has been banned from his Tyneside nursery school class for his trendy “tramlines” haircut. The mother of Tavis Cook was told the youngster’s distinctive hairdo broke the rules of Riverside primary School in North Shields. Donna Cook has been told to keep her son away until his hair grows back. You are currently browsing the archives for the Say what? category.